Step into this romantic tulle gown by Theia. A dramatic shape in pure white is a stunning statement - whether you're looking for a storybook entrance or happily ever after. This dress runs small. We recommend sizing up (see following fit notes for exceptions). Sized: 0 - 14. 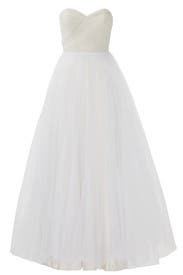 Ivory Tulle. (100% Nylon) Strapless. 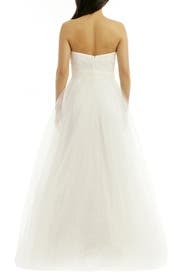 Sweetheart neckline with ruched bodice. Full skirt. Boned bodice. Hidden back zipper with hook-and-eye closure. Lined. See size and fit tabs for lengths. Imported. I ordered this dress as a back up in case my original choice did not fit. It was the perfect simple wedding dress. In reviews the dress is said it runs small. I have a smaller upper torso so I think the 4 would have fit without a bra, but the six gave me space to wear a bra. I felt like a princess wearing this dress. I didn't take any pictures, but if my original did not fit I would not have been disappointed. This dress surpassed my expectations! This dress is amazingly beautiful and I'm so glad I rented it! 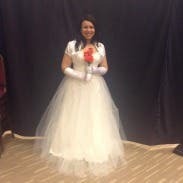 I picked it for a DAR state conference - I was paging and needed a white evening gown that wouldn't break the bank. It is two different shades top and bottom, like others have said, but it isn't that noticeable and it didn't photograph as two colors. 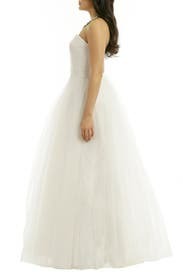 The skirt is more a-line and the tulle gives it a nice ball gown silhouette without being huge, puffy or too hot. I ordered a 4L and a 6L - I usually wear a 4. I wore the 6, and it turns out I did not need the extra length, though it didn't drag. I got so many compliments on this gown - I would absolutely rent it again! I felt beautiful. I got so many compliments. Had complete strangers taking pics of me. It was very hard to zip but once it was zipped it cinched my waist like crazy and i loved it. Very flowy. Perfect length for me. Has built in bra so i didnt need one. 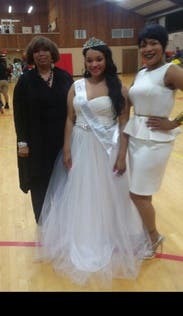 Everyone gave so many compliments on my daughters gown for her pageant all nite long.....!! The rental experience was great. The only problem is that they sent to size 12 dresses instead of a 12 and a 14. But we made due with the 12......!! Perfect dress for the perfect occasion for the perfect price! It was everything I imagined it would be. I paired it with the belt and it was beautiful! That you can actually have a back uo size just incase it dont fit . 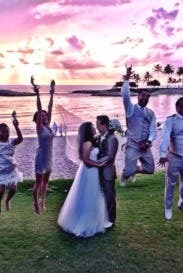 It was a little tight but I managed to fit on it I wore it onour beach wedding theme in Oahu. Dress ran way too small in the bust area. I have a wide back, but I can usually fit into a 14 at least... but not even with this dress. I would've been perfect for our wedding dinner reception, but it didn't work. The dress is way more puffier than the picture shows. It'll be perfect and a great cost for anyone who always wanted a tight bodice but ballgown feel dress. The transition between the two fabric types is a little tough, especially if it is a snug fit. 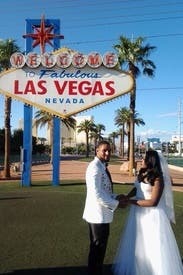 I wore converse with it and the dress needed to be held up while I walked. I think it would have take really high heels to get it off the ground. I used this dress at a wedding show. My model wore this dress. 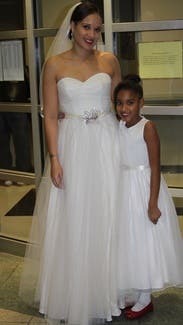 This dress was perfect for my model at the wedding show! I rented the 10R & the 12R. She wore the 12 with heels & it was perfect! It does run a little long, so heels are necessary. People loved it! I got compliments all night. Super comfortable to wear too. It fit pretty well except for the fact that it was not quite long enough. I am 5'10 without heels and like to wear at least 5 1/2 inch heels but had to end up wearing 4 inch heels. What does the detal on the bodice look like? Rented this for a wedding photo shoot and it was gorgeous. Fit our model like a glove but definitely needed a fabulous belt to finish it off. We didn't select it only because we needed something a bit more modern. No complaints. Hi.. What height heels did you end up wearing? Hi, what height heels did you end up wearing? Perfect as a cost-effective alternative to a wedding dress for Halloween! True to size, I wore this dress as a Halloween costume to be the "Ms. Piggy" half to a "Ms. Piggy and Kermit get married!" couples' costume! The alternative was to pay almost the same or maybe more for a second-hand wedding dress that would probably be from the '80's (although at least the big sleeves would work for Ms. Piggy), but this was more stylish and way more fun to wear! I felt like a princess bride, the skirt was fun and flowy, just what I thought Ms. Piggy would wear! 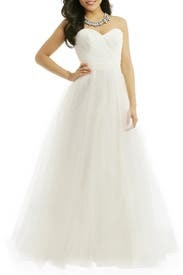 I didn't end up wearing this dress for my engagement photo shoot because it was not super flattering, and the bodice and skirt were somehow two pretty different shades of ivory, which unfortunately made the bodice look dirty. The bodice is very structured, it felt like my body had to change to fit the the dress's shape instead of the dress adjusting to my shape. And sadly, the shape was sort of barrel-ish on me. I looked very round and fluffy. 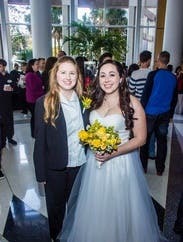 The dress made my event!! 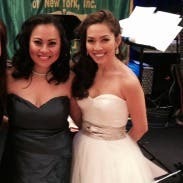 I wore it for my debutante and masters event. The dress fit perfectly. The dress fit perfectly. The only thing I did not like was the tulle. It did not lay flat and would trip me up. The overall look of the dress was awesome. Everyone loved the dress. It went perfectly with my gloves and jacket. Hi what height heels did you wear? This is without a doubt a wedding dress. And if you're looking for one, look no further. I was able to accessorize this with a dark belt and dark jewelry to make it more avant grade but it still looked very bridal. So I would not recommend this unless you are specifically looking for a white dress. When you get it don't be alarmed that the bodice is a slightly different hue than the skirt. It doesn't show up in photos. The fit is perfect and figure flattering and there's plenty of tulle. I did notice that in the wind it lost some of it's bulk and you could see the lining. I think this is a dress best suited for an indoor occasion. You can wear it with or without a strapless bra. The dress photographed well and was easy to move in. The dress fits true to size. My daughter got the 8L and wore it most of the time without shoes (she is 5'9"). It was easy to move in despite the top fitting snuggly (it has no give). There is a difference in the color of the top and the bottom. The top tends to be more off white than the bottom. This was not really noticeable in the pictures. I expected some wear on the dress but was disappointed to see a small repair on the front of the bodice. My daughter said the dress smelled. She didn't have it on long enough for it to really bother her. 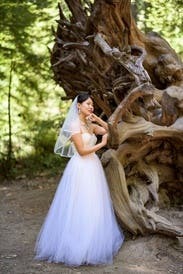 We rented the dress for some photographs that she had done. Overall a good experience. We will rent again. 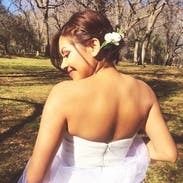 Used this dress for a secret garden themed shoot, it was perfect! The bodice & skirt are two different colors, which is a little odd- but that didn't show in the images. The tulle skirt photographs beautifully and although it looks beautiful without a belt, it's even better with one. Model normally wears a size 0 and the 0 fit fine. 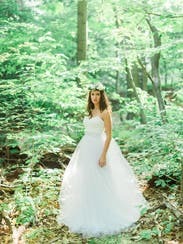 I used this dress for my bridal portraits, because I didn't want to risk getting my dress dirty. This Dress Fit perfectly, and the pictures turned out beautiful. I did this photo session outside, and the dress wasn't heavy or hot. 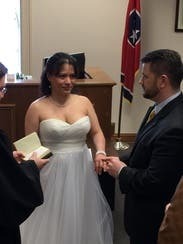 The only thing that was wrong with this dress, is the particular one I rented had a defect with the zipper. The zipper would struggle to zip up, even when I wasn't in the dress. Overall, a great dress! True to size and comfortable to wear. Accessories are a must- the dress itself is rather plain but it can be easily accessorized. That picture & dress is beautiful!! This is my 2nd time renting from RTR and I was extremely satisfied with this dress! The dress was layered multiple times so I didn't have to worry about it being see through. I added a belt around the center to add some sparkle. 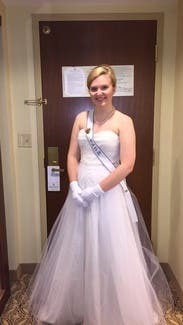 This was the perfect dress for the event which required a white gown. I would highly recommend it! I got compliments all night! The dress fits perfectly ! I ordered this dress for a wedding photography session. In love, it fit perfectly! I was propose to on a Wednesday. 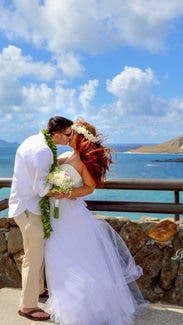 Got married on the following Saturday! RTR is the only way to go!! The dress is true to size. I stand 5 foot even and ended up with the dress dragging the floor. Which was fine because I really didn't move around much and when I did I just gathered it up. I was wearing Toms wedge heal. Im not sure how high they are. I think they are two inch and i still had a good three inches of dress on the floor. Perfectly paired with the "Eternally Yours Bridal Belt"! 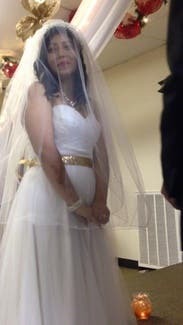 It was the tulle dress I dreamed about I added the pearls and long veil and it was truly magical. 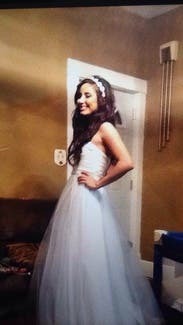 I loved this dress, I felt like a princess in it. It ran true to size and was extremely comfortable.